More than 5,000 scholars from over 50 countries: three times a year we invite qualifying teams from all over the world to join us for Global Rounds that bring together our entire international community. The first of our Global Rounds in 2019 will take place at the China National Convention Center at the very center of one of the world's most cosmopolitan cities from June 21 to June 26. 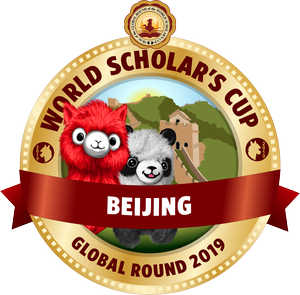 You’ll experience scavenger hunts, keynote speeches, panel discussions, our signature cultural fair, the Scholar’s Ball, and, of course, all the competitive and community-building events that drew you to the World Scholar’s Cup in the first place, from the Debate Showcase to the Scholar’s Bowl. Every participant will walk away with new friends, new discoveries, and very large alpacas—and all participating teams will have the chance to qualify for our year-end Tournament of Champions at Yale University. We encourage all participants to stay at one of our recommended hotels, some of these are within easy walking distance of the China National Convention Center (CNCC). Special negotiated rates include WiFi and breakfast. Please use the Online Reservation System to reserve rooms. Please note that seats on the optional shuttle bus from official hotels to and from the China National Convention Centre are available for advance booking at a nominal fee of $60 per person; please reserve seats through our online reservation system. Transportation is provided at no charge from all hotels to the debate schools and from the Scholar's Social to all hotels. Airport transfers will be offered by Beijing Youth Travel Services, our official ground partners. Optional excursions include a city tour that will includes visits to Tiananmen Square, Imperial Palace, Temple of Heaven and a Kung Fu Show; and a trip to the Great Wall of China along with the Summer Palace. If you qualified for the Global Round at a regional round and now need an official letter of invitation to show your school, potential sponsors, or a consulate (for visa purposes), please refer to your delegation leader for a global round invitation letter. This person is the contact person listed in your registration form, and the letters are emailed out after each regional event. If your embassy requires a more specific visa letter, we would be happy to issue one after registering for the Global Round. Please email us at [email protected] to do so. Note that parents who are not AIAs or DAAs will not be included in these letters, and they should use their child's invitation letters in support of their visa applications. Can't make it to Beijing? Learn more about our The Hague and Sydney Global Rounds, as well as our lower-cost and more accessible Astana, Manila, and Durban Mini-Global Rounds! Held in July, August and September, all rounds offer the same events and Tournament of Champions qualification opportunities as in Beijing.